When one is asked to think of hockey in Alberta it is most likely that one’s mind will be immediately flooded with thoughts of the Edmonton Oilers. When the Alberta hockey scene is the topic of interest one can be forgiven for having Oilers’ centric thinking due the Oilers’ past (five Stanley Cup Championships in the mid-1980s) and future (Connor McDavid–enough said). 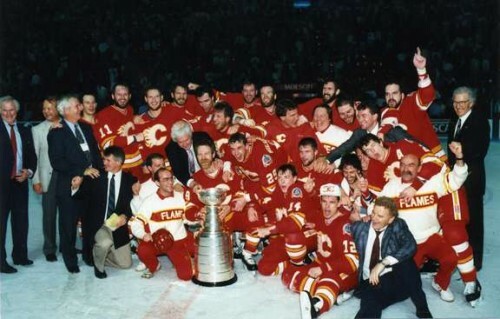 With this being said, the Calgary Flames–the Oilers’ Southern Alberta neighbour–are no slouch franchise. 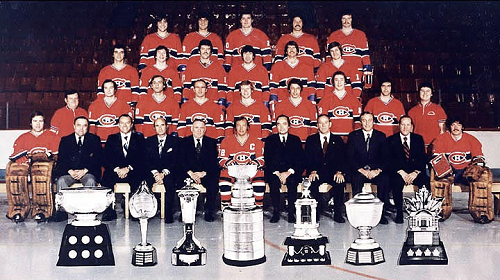 While the Flames have not had the same success as the Oilers (only one Stanley Cup Championship in 1989), the franchise has employed perennial playoff teams and some of the best players in the game. As most “All-Time Best” articles show, it is easy to list off the best players of a franchise based on stats. 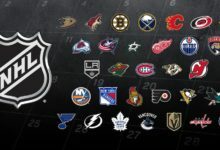 This article, however, aims to present the best starting lineup that the Flames could ice against their highly thought of neighbours to the North, rivals from British Columbia, or any other franchise. 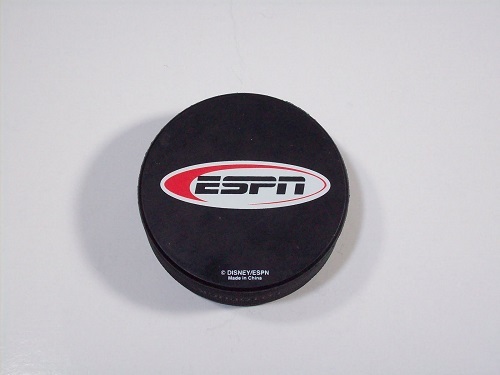 An overused hockey cliché states that good teams are built from the crease out. Unlike the Flames, most franchises have not been able to employ a consistent and reliable starter like Miika Kiprusoff (Kipper). Yes, Mike Vernon was the Stanley Cup winning goalies in 1989, but his stats (regular season and playoffs) are less than impressive when compared with those of Kipper. Kipper is first in all of the Flames’ major goaltending categories: 576 games, 305 wins and 41 shutouts. Over his nine seasons with the Flames, Kipper posted a GAA of 2.27 and save percentage of .913. Kipper’s GAA and save percentage are not the best in Flames’ history, however, they are only surpassed by those who played significantly fewer games. When considering playoff statistics, Vernon does have more wins, but Kipper has a better GAA, save percentage and more shutouts. 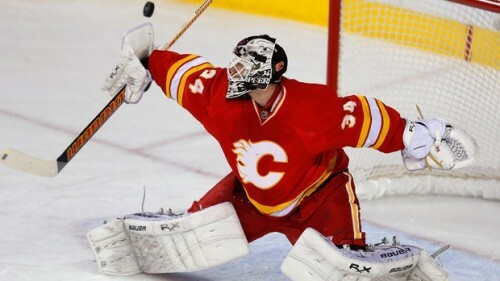 Overall, during his tenure with the Flames, Kipper was a more than reliable backstop and was often the sole reason some mediocre teams made the playoffs. 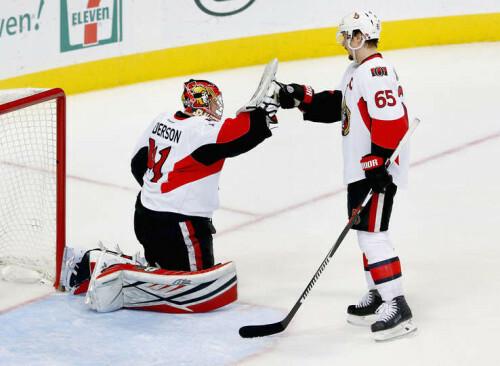 Other career achievements to consider are Kipper’s Vezina Trophy winning 2005-2006 campaign (42-20-11 record, 2.07 GAA, .923 SV% and 10) and an invigorating run to Game 7 of the Stanley Cup Final in 2004. Easily the best defenceman to ever dawn a Flames jersey. MacInnis played 803 regular season and 95 playoff games across 13 season for Calgary. Through his 803 games MacInnis became known for his offense by accumulating 822 points, including a franchise-leading 609 assists. MacInnis’ 102 playoff points with the Flames established him as a playoff performer. Much of MacInnis’ offensive success can be attributed to his booming shot as he won the NHL’s hardest shot contest two times as a Flame and seven times overall in his careers. While he is known for his offensive production, it cannot be ignored that MacInnis also managed to post a +241 rating over his time with the Flames; thus, making him a valued two-way defencemen. How can Giordano be considered ahead of Gary Suter and Paul Reinhart? This writer understands the question but like was said at the beginning of the article this is not a list of all-time best players based on stats. 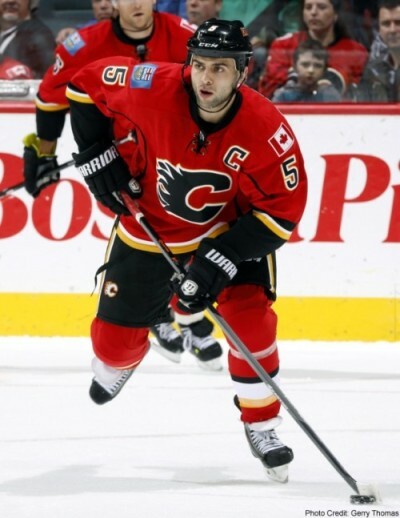 Over the last few seasons, Giordano has established himself as not only the leader of the Flames but a premier defenceman in the NHL. In fact, this writer (along with many others) believes that if an injury had not limited his 2014-2015 season, Giordano would have been a finalist for the Norris Trophy. Over the course of nine seasons, the undrafted Giordano has played 510 for the Flames and has accumulated 245 points (fifth all-time for Flames’ defencemen). Giordano is a late bloomer and is just now entering the prime of his career where he will be leading one of the League’s most potent defense corps. Giordano’s leadership, two-way play, and left-handed shot make him a perfect complement to MacInnis on this roster. More importantly, when Giordano’s career is all said and done (barring injury problems) there is no doubt that he will be one of the two best Flames’ defencemen of all-time. Similar to Al MacInnis at his position, Roberts is the best the Flames have ever employed at his position. 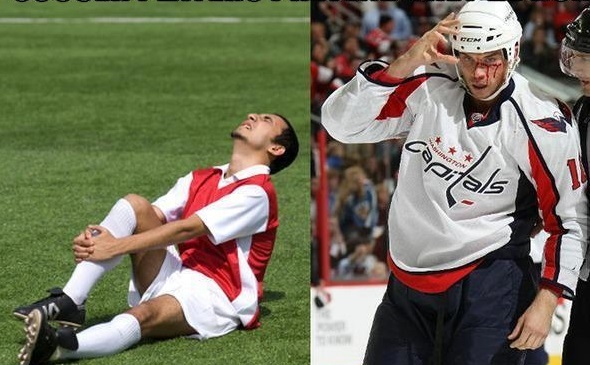 During his playing career, Roberts was the full-package in terms of grit, hockey sense, and offensive skill. Over his 585 games with Calgary, Roberts scored 505 points (most all-time for franchise left wingers), had a +225 rating, and took 1,736 minutes in penalties. These stats epitomize Roberts’ ability to keep up with the stars, defend teammates, and protect his team’s end of the ice. Thus, Roberts would be the perfect starting left winger for any team. The success that Nieuwendyk had as a Flames’ centre is unmatched by any other to play for the team (Sean Monahan may have a chance to match it). As a rookie in the 1987-1988 season, Nieuwendyk won the Calder Trophy after accumulating 92 points including 51 goals. Nieuwendyk would go on to play 577 games scoring 314 goals and 302 assists for Calgary. Throughout his Flames tenure Nieuwendyk was the consistent offensive threat any team requires from its top centre. Nieuwendyk also established himself as a strong defensive contributor by accumulating a +135 rating and high faceoff winning percentage for the Flames. His hockey sense and overall offensive capabilities make Nieuwendyk an ideal number one centre. After coming to Calgary as a relative unknown in the deal that sent Joe Nieuwendyk to Dallas, Iginla transformed himself into a Flames’ legend. 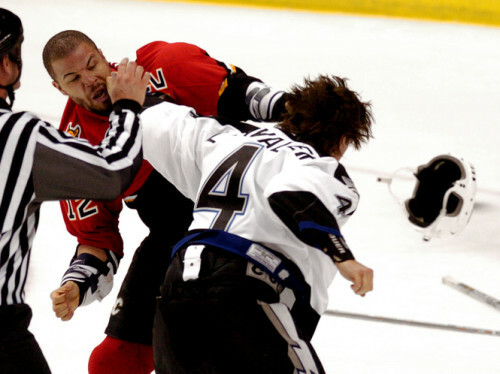 During the prime of his career, Iginla was NHL’s premier power forward and the ultimate depiction of a team leader. Iginla is the Flames all-time leader in games played (1,219 – only player over a 1,000), goals (525), points (1,095), powerplay goals (161), shots (3,992) and game-winning-goals (83). Iginla also has two Rocket Richard Trophies, Art Ross Trophy, and two Olympic Gold Medals to his name. Considering his statistics and what he intangibly meant to the franchise and Calgary community Iginla remains the most premier player to ever wear a Flames jersey. Considering, the grit, hockey sense, and premier talent that the five players discussed in this article have, this writer has no doubt that this starting lineup would be able to challenge that of any other team. Obviously, there are some notable omissions but this does not limit the writer’s opinion of the omitted players. This writer was attempting to put together a lineup that consisted of players who if given the opportunity could legitimately gel together and be successful based on their individual skill sets. For those still in disagreement please see my second line below or debate me @dwiggz7.